The Philadelphia Flyers®, National Hockey League (NHL®) and adidas today unveiled the new adidas ADIZERO Authentic NHL jerseys for the 2019 Coors Light NHL Stadium Seriesä. 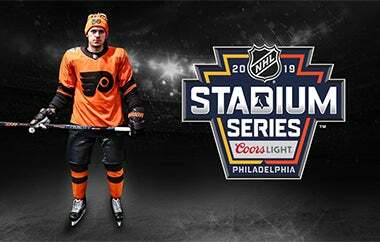 Specifically designed for this game, the special-edition uniforms will make their on-ice debut when the Flyers hit the rink outdoors at Lincoln Financial Field® on Saturday, February 23. The game will be broadcast at 8 p.m. ET on NBC in the United States and on Sportsnet and TVA Sports in Canada. The 2019 Coors Light NHL Stadium Seriesä jersey will be available for purchase for the first time exclusively at Wells Fargo Center beginning on Saturday, February 2. The New Era team store will open at 10 a.m. to accommodate fans prior to the Flyers facing off against the Edmonton Oilers at 1 p.m.
Monday, February 4 – 10 a.m. to 3 p.m.
Tuesday, February 5 – 10 a.m. to 3 p.m.
Wednesday, February 6 – 10 a.m. to 5 p.m.
Thursday, February 7 – 10 a.m. to 4 p.m.
Friday, February 8 – 10 a.m. to 4 p.m. These new special-edition uniforms embrace the intrastate rivalry in every detail, specifically through the Flyers’ use of their heritage Burnt Orange. In addition to new cresting and embellishments, this year’s jerseys add oversized stripes that have been magnified to scale for Lincoln Financial Field. Philadelphia’s jersey highlights a scaled-up version of the chevron stripes from their 1992-2007 looks. Additional design details for the Flyers jersey includes “PHILLY” in block letter stenciling to represent the host city, along with a special-edition 2019 NHL Stadium Seriesä patch on the right shoulder of the jersey. The special-edition Flyers adidas adizero Authentic Pro NHL Stadium Series™ jerseys will be available online at Shop.WFCPhilly.com or in person at the New Era Team Store at Wells Fargo Center.